It was a dark and stormy night… oops, wrong story. Let me try again. It was during a brutal winter storm in late 2012 that my good friend – and talented photographer – Adam Baker and I met in Ithaca to toss around the idea of producing an e-book together. And now 9 months later, we are excited to announce that it is finished and available for purchase! If you want to read more details of how the e-book evolved, read on. To get right to the good stuff though, check out our website: http://www.adkbook.com where you can preview and buy the book. (In fact, I dare you not to look at our website! It is simply stunning, though we can’t take any credit for it. We are indebted to the uber talented Tyler Finck. Not only did he create the website, he also produced the font that we use for the cover and throughout the book. He’s one talented dude). Since getting to know Adam several years ago, we’ve been fortunate to take several photography trips together. In fact, just a few weeks ago we returned from an intense week-long stay in the Canadian Rockies. Each trip requires a huge amount of planning and virtual scouting. We have been the beneficiaries of numerous e-books from other photographers. But we quickly realized that for one of our favorite places to photograph – the Adirondack State Park in New York – there were little to no resources available to photographers. Sure there are plenty of coffee table-style picture books from the region, but nothing that tells you where and when to shoot. 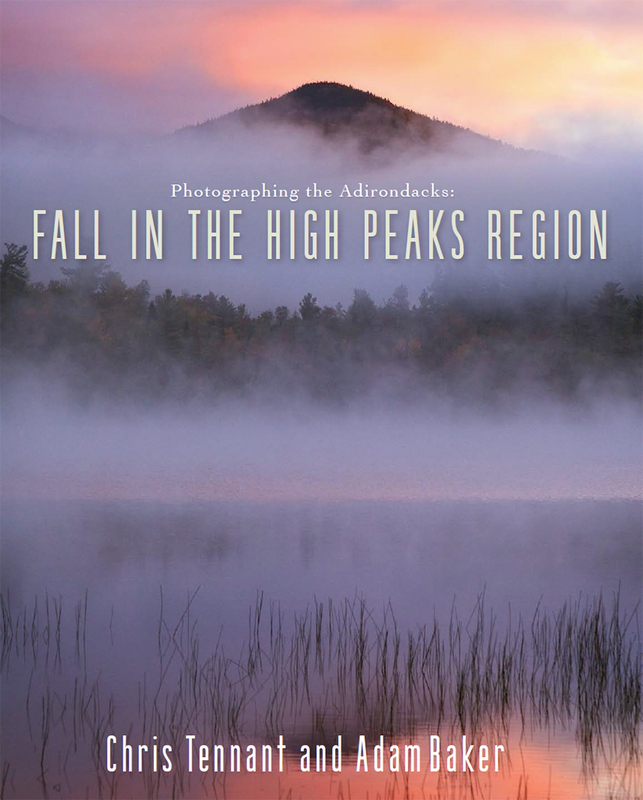 After photographing the region for several years, we put our collective notes and photographs together to produce “Photographing the Adirondacks: Fall in the High Peaks Region”. At over 6 million acres the Adirondack State Park is simply enormous! So the first e-book in the series is dedicated to the High Peaks region (loosely centered around the village of Lake Placid). This informative e-book is over 100 pages, and in addition to 50 beautiful photographs, includes GPS coordinates, detailed driving directions and descriptions for 24 of our favorite locations. You can preview and purchase the book for only $7 from our website.